Amritsar: A local court today convicted three persons accused for committing Beadbi of Guru Granth Sahib at village Ramdiwali Musalmannan in Amritsar district. 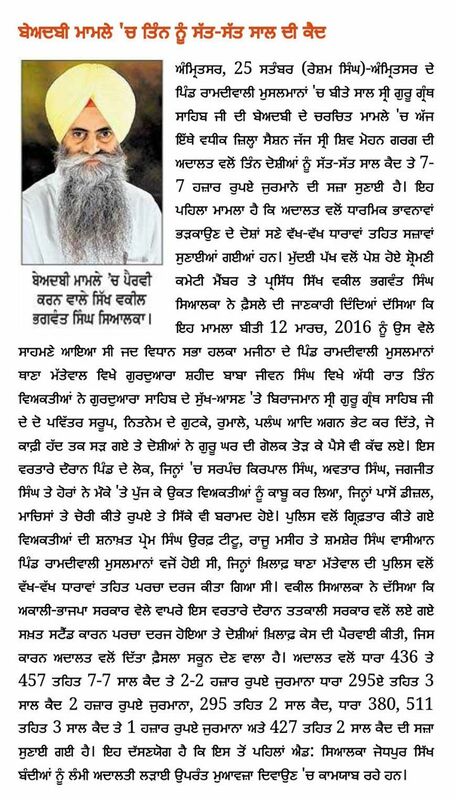 The incident of Beadbi had taken place in March this year and three accused persons namely Shamsher s/o Lakhwinder, Prem Masih s/o Teetu and Rajan Masih were caught by village residents and Sri Guru Granth Sahib Satikar Committee. All three accused were sentenced by the court of Additional District Sessions Judge for imprisonment of 7 years each. The court also imposed a fine worth Rs. 5,000/- to each convicted person.